Scott Kingery leads all Eastern League players (min. 200 at-bats) in home runs (18), total bases (145), and OPS (1.007), and ranks second in OBP (.382) and stolen bases (14-for-16). The Phillies will conclude their latest dreary road trip with a pair of games at Fenway Park in Boston today and tomorrow, before returning home to play the latter half of their four-game, home-and-home series with the Red Sox at Citizens Bank Park. They have … played better baseball. The Phils are in the midst of their third losing streak of five games or more in the last 23 days. Even worse, they lost the player who has arguably been their best hitter in the last year. Second baseman Cesar Hernandez was placed on the disabled list over the weekend with an oblique strain. And if we know anything about oblique strains, it’s that they almost always keep a player sidelined for at least a month, regardless of severity. If you don’t think Hernandez is a big loss from the lineup (particularly a lineup starved for production, especially players with on-base skills), think again. Here is what Hernandez has done over the last 365 days: .305/.384/.420 with 10 home runs, 19 doubles, nine triples, and 20 stolen bases in 153 games. Translation: more than two-thirds of baseball would love to have a 27-year-old second baseman with that kind of offensive profile in their lineup. The Phillies will not have him for a while, perhaps not until after the All-Star break (which begins on July 10). So what’s a team to do? Easy: promote its 23-year-old second base prospect who is tearing up the Eastern League. Is promoting Scott Kingery premature? Won’t it affect his development? Isn’t this just a reactionary move, not necessarily done in the name of the individual player’s development but only because of major league team need? Michael Saunders, who went unsigned on the free agent market until mid-January, is out of the starting lineup for tonight’s game in Boston. It’s the third time in the last four games that Saunders is out of Pete Mackanin’s lineup. This isn’t necessarily surprising: Saunders is slashing .203/.250./359 in 204 plate appearances over 58 games this season. Saunders, who signed a one-year, $9 million deal with the Phillies, hasn’t been able to get a thing going for two months now and it’s difficult to believe that, even if he does get on a hot streak in the next month, any team is going to have any interest in acquiring him before the non-waiver July 31 trade deadline. His entire career has been marred with inconsistency; it’s hard to imagine contending teams lining up to add him to their lineups. So what does Saunders have to do with Scott Kingery? Good question. Another veteran on a one-year contract, Howie Kendrick, has slid from left field to his former second base position to replace Hernandez for the time being. There’s nothing necessarily wrong with this (although Kendrick’s defense isn’t terribly great in the infield) but the domino effect has Daniel Nava in line to get more regular playing time in left and we’re not sure how it makes any sense whatsoever for a rebuilding team to start giving regular playing time to a 34-year-old bench player. Summon the red-hot Nick Williams up from Triple-A to take those outfield at-bats? Also not a bad idea. We’re not sure if Williams is ever going shake his inability to draw walks and avoid strikeouts, but he surely is producing with the IronPigs regardless. Still, we like the idea of Kingery better. The Phillies have had internal discussions about playing Kingery at other positions in the minor leagues this summer to increase his versatility. Again, Hernandez has been very productive over the last year, so it wouldn’t be the worst idea in the world to get them both on the same field at some point. It’s not just his defense, though. 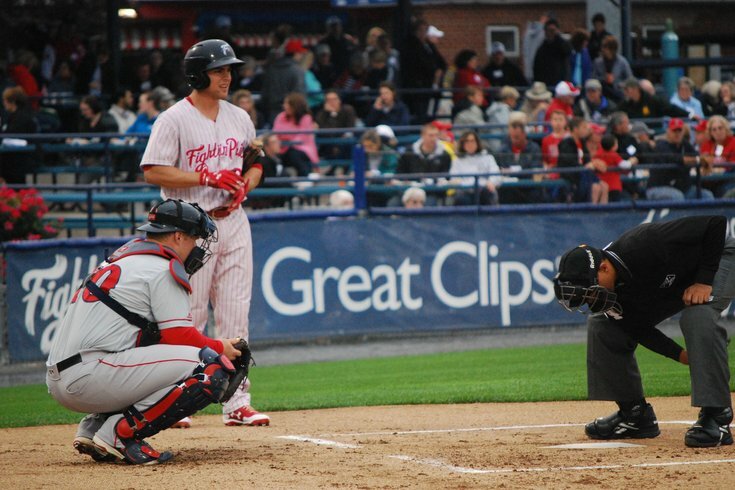 Kingery entered Monday slashing .306/.382/.625 in 58 games/264 plate appearances at Reading so far this year. He leads the Eastern League (among players with at least 200 at-bats) in home runs (18), OPS (1.007), and total bases (145 – 17 more than any other player), and ranks second in OBP (.382) and stolen bases (14-for-16). So the kid is clearly ready for a challenge. And why not the big leagues for a month, bypassing Triple-A? Because it’s not just the defense or the potent bat that makes Kingery, a former second-round pick, a special prospect. He also has strong mental makeup, something you pick up just from talking to the uber-confident, unflappable Phoenix native. If he arrived in the big leagues tomorrow and then had to be optioned back to the minor leagues in a month, Kingery wouldn’t be affected adversely. He would understand the big picture, keep his head up, and continue to have the same mentality he’s had since being an undersized, under-recruited high school senior who had to walk-on to play at Arizona. You have to know not only the physical ability of your prospects but also their mental psyche in good times and bad. Kingery can handle a one-month audition that may end up with him pulling a Roman Quinn/Jorge Alfaro, bypassing Triple-A to get a brief taste of the big leagues … only to eventually make his way to Triple-A. Kingery is not currently on the 40-man roster, but the Phillies cannot simply spend all summer using this as some kind of excuse. There are plenty of players you can part ways with (and will part ways with) before the end of 2017. We wrote this three weeks ago and stand by the point, if not the player: the lifeless Phillies need an injection of youth into their lineup. Quinn was the name we mentioned then, and it would have made sense, but he’s now sidelined indefinitely with an elbow injury. So, Kingery. He plays with the same energy (think Quinn last September, and, perhaps, Washington’s Trea Turner) and would be an ideal newcomer into a lineup that has struggled to generate much since it currently has four regulars with sub-.300 OBPs (Saunders, Maikel Franco, Odubel Herrera, Freddy Galvis). Since scoring 4.61 runs-per-game in April, the Phillies have averaged 3.58 RPG since May 1. They have lost 31 of 41 games overall. The Phillies’ decision-makers are open to change and giving young players a chance. Andrew Knapp is back behind the plate in Boston today. In the last three-plus weeks, Knapp and Cameron Rupp have evenly split 22 starts with 11 apiece. It’s smart and sensible. Knapp, a 25-year-old, former second round pick, deserves to get a long look and major league audition while Alfaro continues to develop at Triple-A. It’s also smart and sensible to reward Kingery with a promotion to the big leagues since there just so happens to be a vacancy at his position and he has the mental aptitude to handle it, even if it only lasts for a few weeks.